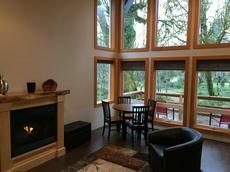 Hoh Valley Cabins at Elk Meadows provides a restful retreat in the heart of the Hoh Rainforest, just minutes from the Olympic National Park, ocean beaches, Hoh, Sol Duc, Bogachiel Rivers and many other exciting or restful activities. Comfortable, modern cabins offer a restful, rain forest retreat. Come, unplug and enjoy the elk, rivers, and Hoh Rainforest. Fully equipped to sleep 4 and with a full kitchenette.